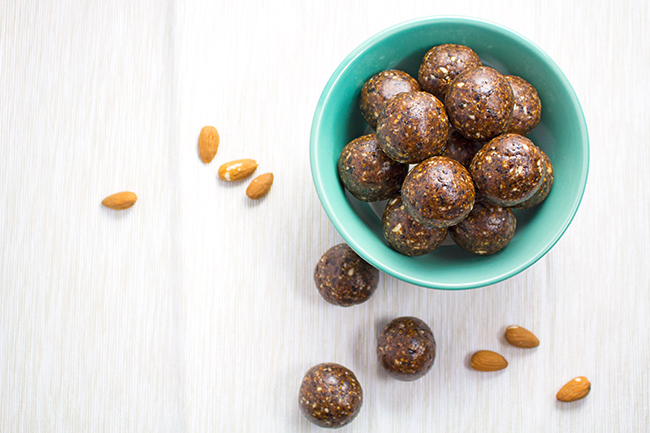 Dried figs, prunes and almonds, all rolled together into little bite sized balls that are guaranteed to keep you energized for hours. Whenever I go home to Sydney I always stay with my Mum, and we have such a great time together. Shopping for hours, until we literally drop. Having conversations that are filled with smiles and laughter. Chilling out on the couch watching TV and coloring in adult therapy coloring in books simultaneously. Yes we are those type of people. And making a great variety of healthy packed meals in between all the eating out. 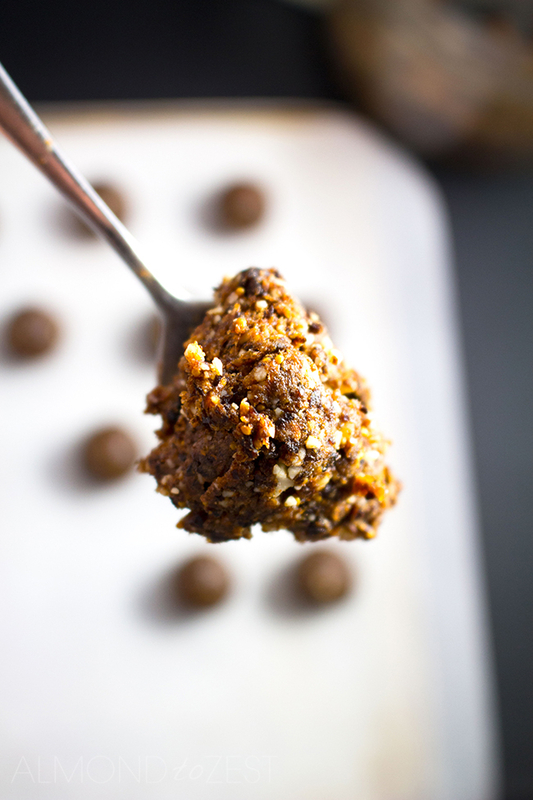 I remember the first time that I ate one of these no-bake energy balls bites. It was about a year ago and we had arranged a couple of days of intense shopping at a few of the local malls. This means getting up early and arriving at the malls before the car parks fills up. Cause no one wants to waste time circling around car parks when it could be spent shopping right? Mum had decided that we would have to make something quick and easy to nibble on before we left. Mainly because I take foooreeeevvverrr to get ready in the mornings. Still not a morning person even after years of waking up at 4:30am. Before I knew it she was throwing a bit of this and a bit of that into her food processor. Then quickly rolled the mixture into balls and placed them in the fridge. She pulled them out right before we were about to exit and passed me one. And OMG guys my Mum totally nailed it with this recipe. Which is why I just had to share it with you guys today. You only need five ingredients to make them. Your food processor does all the hard work for you. They take less than 10 minutes to blitz and roll. And only need 30 minutes to chill. They are raw/no-bake, dairy free*, gluten free* and are suitable for vegetarians and vegans*. They are incredible tasty and super healthy. Bonus!!! The healthy combination of prunes (dried plums) and dried figs are everything in these quick and easy balls. They provide a fantastic flavor, the tart prune sweetened with the figs flesh. And the high level of fiber in both these fruits provide amazing weight loss properties. 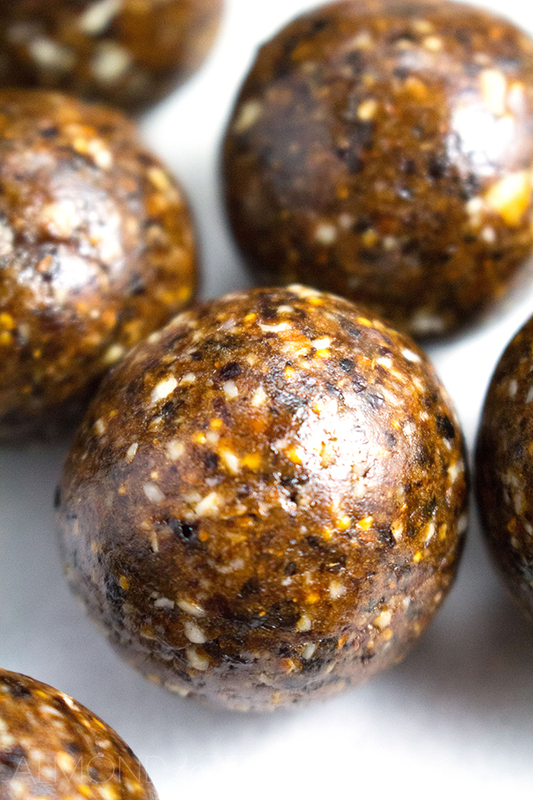 You will also love how the edible seeds from the figs give a crunchy, poppy sort of texture to the balls. My Mum uses almonds for these energy balls but really any nut of your choice would work here. They get blitzed down to a great texture. Not too fine, not too chunky, just enough to provide a subtle crunch. The protein powder prevents the fruit from sticking together and gives you are hit of energy. She used a chocolate flavored powder here but she has used vanilla in the past and says it also works well. And the coconut oil binds them together and makes them look all silky smooth. After they are all blitzed together, rolled and chilled they will last for 2-3 weeks in an airtight container when left in the fridge. But trust me you would have eaten them waaay before then. I highly recommended that you try these balls. 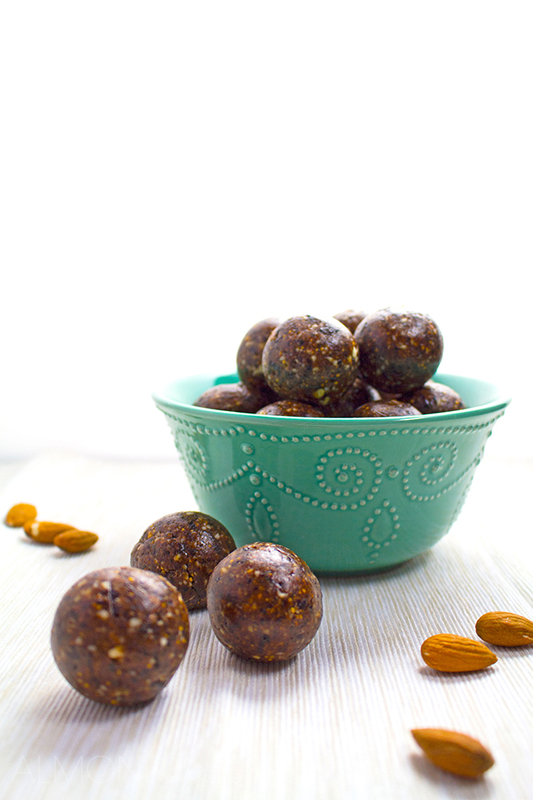 Whether you are an energy ball addict or a first time eater. I guarantee you will fall in love with them. But don’t thank me. Thank my Mum. Place prunes, figs and almonds into food processor and blitz together for about a minute. Almonds may still look too chunky at this stage but don’t worry they will break down further in next blitz. 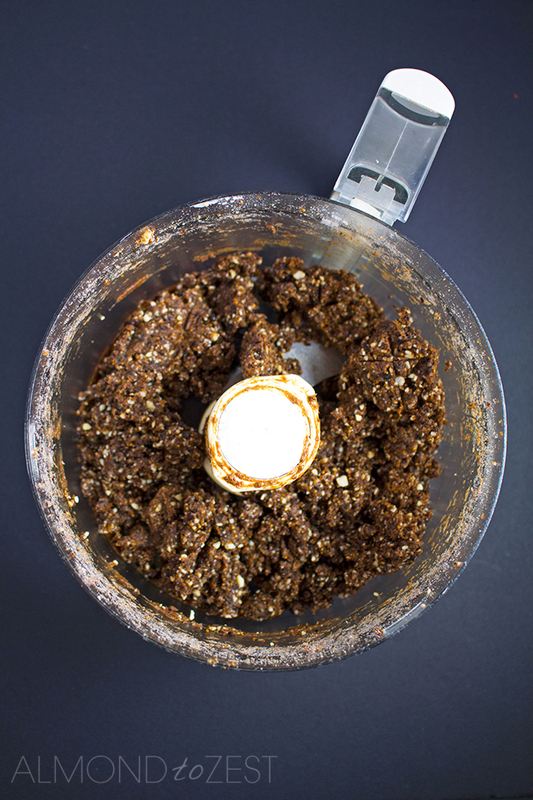 Now place protein powder and coconut oil into food processor and blitz again. You will know it is ready when it forms a ball shape. 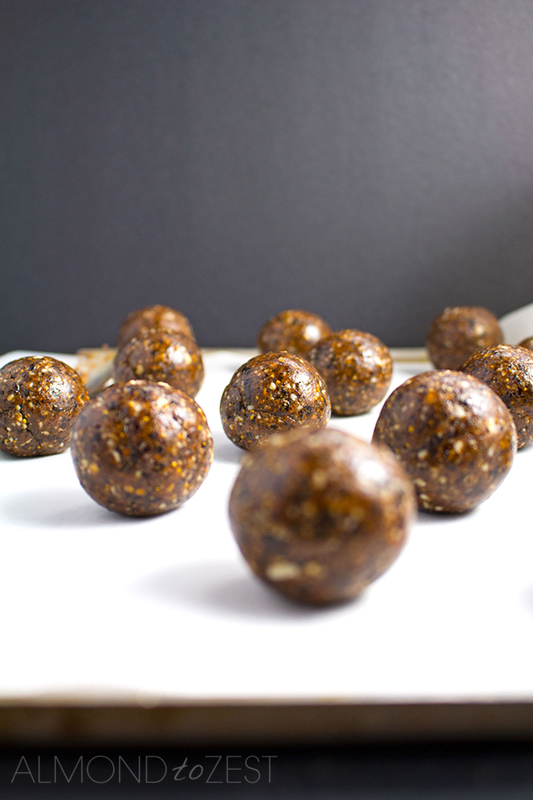 Grab a teaspoon and scoop out heaped teaspoons worth of mixture and roll into balls. Place on to a tray or in a container. Place into fridge for at least 30 minutes. Place into an airtight container and leave in the fridge. They will last for 2-3 weeks. Dairy free, gluten free and vegan will depend on the protein powder that you use. Please check the label on the powder you are using.